1. DO make sure you fully understand how your photographer works, and their style of work before booking. What you see on a wedding photographer’s website and portfolio will reflect the images that you get on the day. I’d recommend asking to see an example of a full wedding from your photographer before booking so you can see how they work throughout a whole wedding. All wedding photographers work in slightly different ways and should be open to you asking questions about this before your wedding. Read more about my style of photography. 3. DO keep your group shot combinations to a minimum. I think group shots are mega important, but am also fully aware (having been a guest at my fair share of weddings) that it’s not exactly the most exciting part of the day. I aim to get your group shots taken as quickly as possible and recommend no more than eight combinations. Allowing for about five minutes per shot may seem like a long time, but trust me, someone always wanders off! I ask my couples to nominate a couple of people from their wedding party who know their family well to collect people together to help speed things up even more. 4. DON’T send your photographer a Pinterest board of photos to capture on the day. Pinterest is amazing for getting inspiration on how to style your wedding and for helping to find your perfect photographer , but when you’ve found one, trust them to do what they do best on the day. Just like the point above about shot lists, a Pinterest board can actually stifle your photographer’s creativity rather than help it. I would also never want to copy another photographer’s work and even if I was willing to do that, unless you’re getting married at the same venue, at the same time of day with the exact same weather and light, we’d never be able to fully recreate the images anyway. By all means send them your styling inspiration boards so they get an idea of what look and theme you’re planning, but trust them to document it in the style that you’ve booked them for. 5. DO be flexible with timing and be prepared to be spontaneous. In the lead up to a wedding, I send my couples a details form to fill out the timings on their day. This is incredibly useful for me. I do however ask that my couples be flexible with timings as well. If an unexpected rainbow or a gorgeous sunset appears, I’m going to want to grab you for an epic portrait. If you see your photographer coming towards you with an excited look in their eyes, gesturing frantically outside, assume it’s time to put down your dessert and go take some photos! Rain on a wedding can also result in the need to be a flexible with timings. 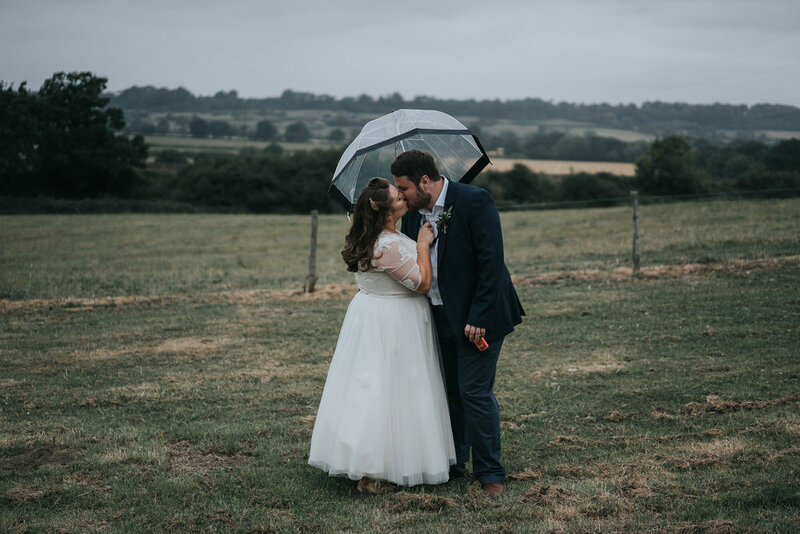 Read my top tips for tackling a rainy wedding. 6. DO be willing to participate in the portrait session. Most of my couples feel awkward in front of a camera - I get it, I’m the exact same. My job is to make you feel as comfortable as possible and to guide you through the session to get the best possible photos (read how I do this here). This does require my couples to be willing to get involved though, no matter how bloody awkward it may feel at first! If someone is unwilling to participate, there’s really only so much direction I can give and it’s likely to show in photos. 7. DO let your photographer know if you have any body hangups. It’s really useful to know whether you’re self conscious about something (even though I nearly always think people are barmy and are gorgeous exactly as they are!) and I’ll work my hardest to capture portraits that you’ll love. Often body hangups are things that we only notice about ourselves, so it’s very unlikely I’ll work this out unless you tell me beforehand. Telling me after your wedding means there’s very little I can do about it. 8. DO feed your photographer on the day. I come to weddings armed with an enormous rucksack filled with camera gear, leaving no space for food (other than a couple of cereal bars). I’m on my feet for at least eight hours and then the travel to and from the wedding can add up to four hours on top of that as well. A lot of venues prohibit you bringing your own food onsite, and lots of the weddings are at venues where they’re only catering for the wedding and there’s no option to buy a meal. So, a hot meal is literally the best thing you could give your photographer on the day, and will make them super happy! Lots of my couples seat me with their guests and feed me what everyone else is eating, but I’m also happy to sit away from guests with any hot vendor meal. Whatever’s easiest! 9. DON’T let your photos go unprinted. The idea of your wedding photos sitting on a USB and not gracing the walls of your home makes me sad. Photos are MADE to be printed. I give my couples a Personal Use License on their photos, which means they can share online, but most importantly, print them as much as they want and create photo books. I also offer free downloads to anyone couples share the access to their online gallery to, so they too can share and print as they wish. I offer fine art prints through and beautiful, fine art albums. Plus, I’m more than happy to recommend print labs to my couples who want to order their own. 10. DON’T put filters over the top of your final photos. Your photographer will take hours to edit your photos to the style you see on their portfolio, so it’s such a shame to then see them looking totally different with an Instagram filter on top. If you’ve booked your photographer because you love their style (and hopefully that’s the reason you’ve booked them!) then share your photos as they’ve delivered them. This photo is from my Aunty Sarah and Uncle Mike’s wedding over thirty years ago. It’s not ‘perfect’ - the quality is a bit blurry (this is a photo of a photo though), the little boy at the front is being a scamp and distracting the adults from looking at the camera, but photos like this are so important. The little boy being a scamp is actually my big brother, and that great big, fat baby is me (I was a serious little porker). I love looking at photos like this - my beautiful Aunty Sarah wore a gorgeous flower crown and I’m fairly confident that Uncle Mike is rocking a mullet. I love seeing my parents at the age I am now (mum with an…interesting hat on…) The elderly couple are my great granny and grandad who are no longer with us and my granny on the far left looks so proud and super glamorous. How smitten is my Uncle Keith with my Aunty Bec?! This photo is a little glimpse at history. Family group shots are probably never going to be the most exciting part of a wedding though (if it is, I think you’re doing something wrong! ), but I do think you should do them. These are the photos that grace mantelpieces, that generations to come WILL look at. Both families together, your wider family, your immediate family, your parents, your partner’s wider family, your partner’s immediate family, your partner’s parents. 4. I work methodically, starting with the biggest group first and working down to the smaller groups to keep guests waiting around as little as possible. I’ll take a few shots of each combination as well as capturing the in-between moments, which is often when guests relax and beautiful things happen!